• Deplores the Employers’ failure to make an offer on 14 February 2014 and their statement on 21 February 2014 that a 1% remit was not negotiable. UNISON’s NJC Committee agreed last week to consult members if we had not received an offer by 1 April. Regions have been asked to start data cleansing immediately for a potential industrial action ballot. Vince Cable has revealed the Low Pay Commission’s recommendation is for a 3% increase in the National Minimum Wage (NMW) to a Select Committee. We have to wait to see whether the government accept the LPC’s recommendation or applies its own increase, but a 3% increase would make the NMW £6.50 an hour. A 1% increase on the bottom NJC scp 5 would give an hourly rate of £6.51 and £6.60 on scp 6. That would make scp 5 a pitiful 0.2% higher than the NMW and scp 6 just 1.5% higher. We are organising a ‘Local Government Needs a Pay Rise’ day within the TUC’s Fair Pay Fortnight on 1 April. We have chosen that date because it coincides with the NJC pay anniversary date. More details will follow in the next Campaign bulletin. 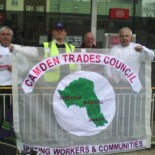 This entry was posted on February 28, 2014 by CAMDEN TRADES COUNCIL.